The long awaited second run of t-shirts are available again! For those of you who missed the first run of shirts either because you recently joined, lived outside the US or just didn't want one at the time, HERE'S YOUR CHANCE! If you bought one earlier and would like another, HERE YOU GO! Shirts are still $20! While CustomInk (Booster) who we used for the first run produced some great shirts, we've moved to Teespring as they offer INTERNATIONAL SHIPPING! The shirts are still Hanes tagless 100% preshrunk cotton! When you pre-order a shirt, you won't be charged until the shirt is printed. Right now we need a minimum of 5 shirts to be pre-ordered or "reserved" before they will create the screen and get them printed. Considering how many requests I've have to bring back the shirt, we should have no problem reaching that limit. The "campaign" will currently run until February 12. CLICK HERE TO PRE-ORDER YOUR SHIRT! If you have any questions, please PM me! Got mine in since I missed it last time. The print is 8.5"x8.5" in case anyone is wondering. The two images of the shirt that are available on the forum are actually snapshots from the shirt preview from the company. I should take a picture of the actual shirt I have. You can see other members wearing theirs in pictures posted throughout the forum. 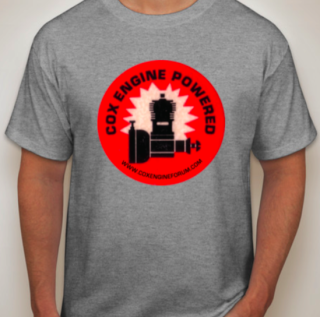 If they are Cox Engine Powered, where do you mount the engine? WingingIt74 wrote: If they are Cox Engine Powered, where do you mount the engine? I could tell you where to mount the engine but it's not very nice. Any chance these will be back? I reserved mine just in case. I'll see what it takes to have them printed again. I know they want a minimum number to be ordered before they will print again. I'll let you know. Thanks! I've been gone from the forum for a while and missed out. These shirts are too cool! It appears we need just one more reservation to have the shirts made again. I need this shirt for the next SMALL event. If you reserved a shirt, they should be starting to print them soon. They will be available for the next 12 days (they make me set a duration). If we've reserved shirts through the old link, will we get them during this new campaign or do we need to resubmit through the new link? UPDATE: I received cancellation notices on previous orders, so reordered via new link. So, I ordered thru the old link last night. Do I need to do it again? I'm glad yall brought that up. My cancellation notice went to my spam box so I wouldn't have seen it if you hadn't mentioned it. Thanks guys. I'm all ordered up now. I thought it said that it would include all reservations as a "pre-order" when I went to "relaunch" the "campaign". I don't think the link changed to the shirt. Thanks for pointing out the cancellation email. Go ahead and reorder the shirt again. Somobody know about sending day??? ?